The Bijak is the most authenticated and sacred scripture of the Kabirpanthis. Besides, the highly illuminated great master Kabir Saheb has spoken a large number of Sakhis other than those depicted in the Bijak. Such Sakhis are compiled in the book entitled "Sakhis Granth". A highly acknowledged scholar and an illustrious holy saint, Sadguru Shri Abhilash Sahebji has extracted some such Sakhis from the Sakhis Granth as have directly or indirectly relation with the poems of the Perfect Master Kabir in the great Bajik. 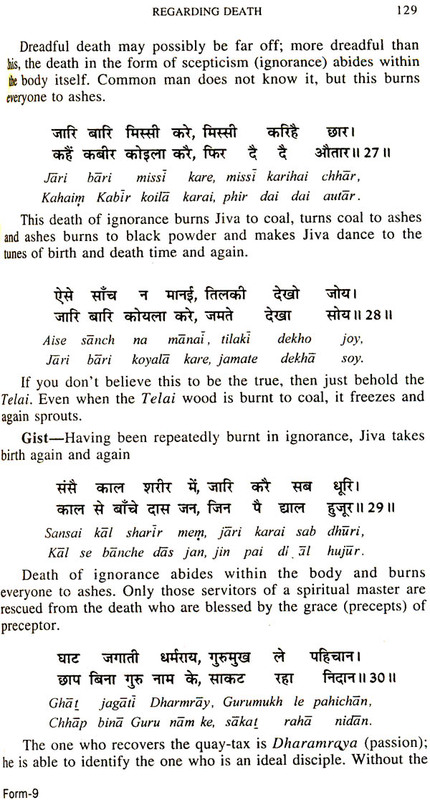 The revered Sadgurudevji has named such a collection as the Kabir Amrit Vani. The Sakhis is not merely a literary genre, but a privileged form of expression, a vehicle of wisdom, rather an evocation of the highest truth. Kabir is all over known essentially as a super composer of Sakhis. He is matchless in the field. This unique composition of the Sakhis has been divided into various small chapters subjectwise, thereby infusing life in it and shaping it as a great treasure of philosophy touching every human aspect to make the life sublime. The Kabir Amrit Vani has therefore, become a quarry of spiritualism and a great work on the art of human behaviour. A discreet reflection over the various subjects contained in this treatise make the reading very interesting and highly beneficial. Here, the chapters relating to the glory and grandeur of the preceptor and the saints enrich the spiritual life of a seeker; and those on the significance of association with the Saints, devotion, selfless service etc. are all the props to make a seeker resolute on the path of spiritualism. The subjects relating to warning, death, sermons etc. contain such soothing Sakhis as can replete the mind with dispassion and lead to the conclusion that we have taken this transitory life or a dream to be the truth. The aspects relating to mind, illusion, wealth and woman alarmingly warn the reader to be aware of the indefensible assaults of delusions, distractions and illusion. Besides this has candidly revealed the maladies of the mental perversions. The mental perversions are highly delusive leading us to the quagmire of ineffeable sorrows by ensnaring us into the false shadow of happiness. Above all, if we reflect upon the facets like lust, anger, greed, attractions and attachment, pride and honour, desires and cravings, conceit and selfness, non-vegetarianism and intoxication etc. we shall find them as venomous snakes, hounds and hawks, as the very noose of death which not only emaciate the physical frame but also eat up the very roots of humanity. With these deadly venoms, man who is anticipated to be a repository of discernment, turns to be a corpse, rather a demon, highly suicidal for the society as a whole. Now follows the legion of virtues which is to totally annihilate the multitudes of the vices. The topics relating to the power of discretion, fortitude, forgiveness, modesty, contentment, compassion and humility have been wisely emphasized and candidly expounded. How a calumniator is highly praised, is an astonishingly interested facet and a great wisdom of Sadguru Kabir Saheb! This invites a lot much grandeur and improvement on the spiritual plane. I heartly thank revered saint Shri Dharmendra Sahebji, the President and Saint Shri Guru Bhushan Sahebji, the Vice President of the Kabir Parakh Sansthan, Allahabad and also my intimate friend Shri P.N. Advani, a Retd Divl. Engineer (Communications) who have assiduously endeavoured to bring shining in the translated script with their wisdom and experience. This marvelous treatise is full of sagacity of the great spiritual master Kabir Saheb who remains unparallel in the arena of poetry overwhelmed with knowledge, dispassion and ever-enthusing guidance to the humanity. Suggestions from the esteemed readers will be highly appreciated. weight of book 555 gms.